The Saskatchewan Sunflower Committee will be holding their Annual General Meeting on January 10, 2019. Anyone interested in learning more about growing sunflowers in Saskatchewan is welcome to attend. The meeting will be held in Regina at the SCIC building at 515 Henderson Dr. Start time is 10:00am. Lunch will be provided. An RSVP to Sherri at 306-848-2856 would be appreciated. 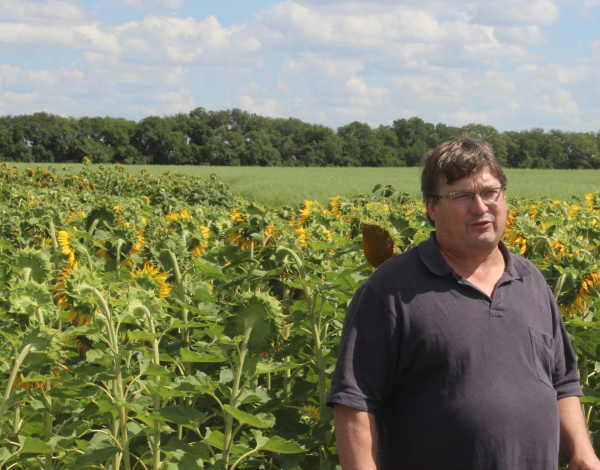 Each year the Saskatchewan Sunflower Committee holds a field day at Indian Head Research Farm in Indian Head Saskatchewan. Bill May with Agriculture and Agri-Food Canada is the host. Participants are toured through Bills current plot trials. In 2018, our was held on August 1. We toured the varietal trials, plant density studies, row spacing, generational linebreeding and nitrogen trials. 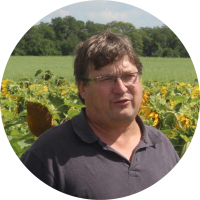 Bill May is the Saskatchewan Sunflower researcher at the Indian Head Agricultural Research Farm (IHARF). Bill's reports are available for download on our Resources and Contact info page. In 2017, our tour was held on August 10. Bills work on varietal trials, plant density studies, generational linebreeding, and salinity tolerance were all showcased. The regional trials are conducted at various locations throughout Saskatchewan. You can download a free copy from our resources and contact information tab.